At just 6 weeks old, a homeless kitten huddled into a car’s engine compartment looking for warmth. But when someone started that car, her tiny leg was caught and mangled in the process. The kitten, subsequently named Marshmallow, was rushed to the vet, where they found that she had three compound fractures in her leg and was showing signs of sepsis. That’s when Cats Cradle Shelter stepped in. After they got word about the extent of this kitten’s injuries and heard that she would likely need to be euthanized, they requested the vet stabilize her while they called in their go-to “Cat Doctor,” Dr. Eric. Because she weighed less than 1 pound and was also septic, surgery would be a risky but necessary option if Marshmallow’s life was going to be saved. Dr. Eric performed a miracle by repairing her internal injuries, but ultimately he couldn’t save her leg and it had to be amputated. After several days of careful monitoring, Marshmallow began to show amazing improvement and recovered quicker than anticipated. Emergency cases like Marshmallows happen all too often, but thanks to volunteers like the folks at Cats Cradle Shelter & Dr. Eric, injured and homeless pets get a chance to live life the way they deserve. Marshmallow’s surgery wouldn’t have been possible without the kind of support our visitors make. Purchases from and donations at The Animal Rescue Site help support animals like Marshmallow who are in need of food, medical care, and ultimately a furrever home. And of course, visitors who play Freekibble’s daily trivia help feed shelter animals: to date, over 17 million meals have been donated to hungry dogs & cats in need! Although Marshmallow’s leg had to be amputated, she’s grown into a well-adjusted young cat. 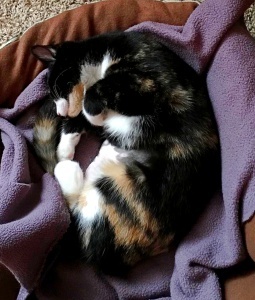 Her story has the purrfect ending, too! 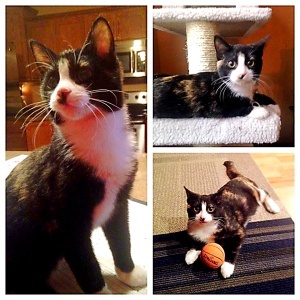 After recovering, she was placed into foster care, then adopted by the women’s basketball coach at a local university. Keep shooting for the win, Marshmallow!